Custom Pet Portraits From your Photos! Pet Portraits by Art Paw are all the rage. We offer a wide variety of color combos and layout options for a variety of tastes. Check out our custom pet portrait styles and then click here for pricing. All you need to get started is a pet snapshot. Order a one-of-a-kind custom pet portrait for you or your loved ones today. Check out our newest videos and see some great examples of pet portraits in the home. You can also follow Rebecca's artdog blog to see what new projects we have going on. Dog and Cat Art Portfolio from Rebecca Collins on Vimeo. Each style has a wide variety of looks and possibilities. No cookie cutter commissions around here! This fine art style incorporates hand drawn lines and traditional painting techniques which are implemented on the computer. Rebecca Collins creates all of the painterly pet portraits herself. With these highly layered works she elevates digital pet portraiture to a fine art status. This style has become our most popular choice. We have been told that our painterly portraits look more like an actual painting than any other digital offerings on-line. 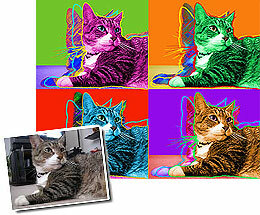 Our custom pop art pet portraits inspired by Andy Warhol have been a big hit around here since 1998. We were the first on the web to offer "warholized" dogs and cats and we continue to have the largest selection. We can create 4 paneled pop art prints or 3 paneled pop art prints in bright colors or soft colors. We even have some terrific single panel 60 & 70's retro pop looks for your cool canines and futuristic felines. This style is sure to please. Paws for thought ... Art Paw has been creating custom cat portraits and decorative dog portraits for the past 13 years. We started off with a few styles including our own take on Warhol. 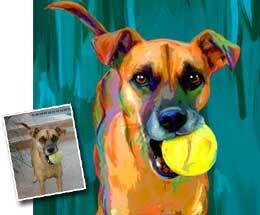 Over the years we have seen many digital studios getting on board to pay tribute to Andy and pop art portraits remain one of our most popular pet portrait styles. Rebecca Collins has gone on to develop her own unique painterly style of working that has become quite popular here at Art Paw by both dog lovers and cat lovers. Rebecca strives hard to capture the unique spirit of her portrait subjects and create modern works of art that will be cherished for years to come. Art Paw has always tried to stay ahead of the pack by offering the largest variety of styles and the highest quality materials available. All of the artwork is printed in-house so that every single step of production has the highest possible quality standard. Shop around and compare portrait services if you like. You will find that Art Paw's goal is not to be the cheapest game in town, we just want to be the very best. We hire only talented artists that understand the difference between fine art and quickie digital service work. A trained eye makes all the difference when it comes to originality and capturing that spark that makes a piece of art jump of the wall. You know your pet deserves the best! Be Sure And Book Mark Our Site!